The Office of Student Financial Assistance is here to help you invest in your future. It's a good idea to apply for financial aid at the same time that you apply for admission to TSU. Although we won't review your financial aid information until after your admission application is filed, you can still apply for financial aid before you have been admitted to TSU. Learn more about your options at TSU by choosing a category below. Financial aid is based on the premise that you, and in the case of dependent students, your parents are primarily responsible for providing for your educational expenses, and it is intended to supplement student and family contributions toward educational costs. 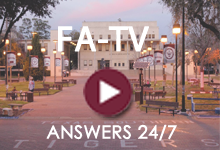 Financial aid comes from many sources, including federal and state government, private organizations, and Texas Southern University’s institutional funds. These funds consist of grants, scholarships, federal work-study, subsidized loans, unsubsidized loans, and parent loans. 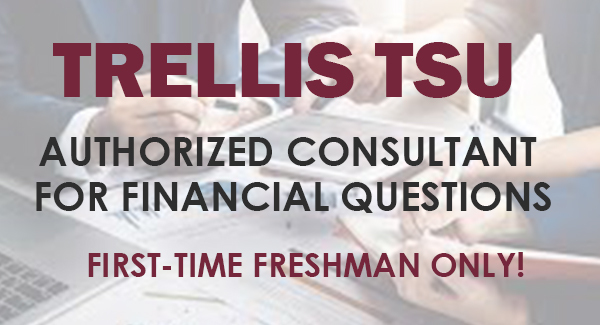 Texas Southern uses the Free Application for Federal Student Aid (FAFSA) to determine your financial need and eligibility for various programs. Your financial aid award is designed to meet as much of your financial need and eligibility as possible and is determined by your need level as determined by the FAFSA, and by the availability of funds. Texas Southern offers merit-based scholarships, as well as need and non-need based financial aid. For a complete list of federal eligibility requirements, visit the Federal Student Aid website. Make sure you meet federal eligibility requirements to receive financial aid. Fill out the Free Application for Federal Student Aid (FAFSA) each year. You may apply as early as Oct 1st using previous year tax data from 2 years prior (for example, the 2018-19 application will use 2016 tax information). Improvements to the FAFSA application process now allow for direct data download from your IRS return. More information on how to utilize the IRS data retrieval tool may be found on the FSA website. List Texas Southern on your FAFSA application using our school code, 003642. The priority FAFSA application deadline for Texas Southern is March 15st but earlier is better. This date is used to determine eligibility for some need-based aid programs as well as State and Institutional funds. Applications received after the priority deadline will still be eligible for federal aid such as the Pell Grant and Direct Loans. Apply for admission to Texas Southern: Apply Online. You will not be considered for any financial aid award until you have applied to the University. After your FAFSA has been received, you may be sent an email request for additional information. Once admitted, you will be able to login to your MyTSU account to view the requirements and the requested forms. If you have been selected for verification, our Verification FAQs (insert the hyperlink to FAQs) will help you with this process. When all outstanding requirements have been satisfied and your FAFSA has been processed, you will receive an email notification that your aid offer is ready to accept. Accept your financial aid award through MyTSU. Undocumented Students: Undocumented students are not FAFSA eligible. Below is a helpful checklist to make sure your transition is smooth and successful. Apply for admission to Texas Southern: Apply Online. Add Texas Southern to your financial aid application (FAFSA) by adding our school code (003642) online at fafsa.ed.gov or by calling the FAFSA processor at 1-800-433-3243. Contact your current school's financial aid office and cancel any financial aid for subsequent terms. You cannot receive aid at more than one school at a time so it is critical that this process occur. After your FAFSA has been received, you may be sent an email request for additional information. Once admitted, you will be able to login to your MyTSU Account to view the requirements and the requested forms. If you have been selected for verification, our Verification FAQs (insert hyperlink to FAQs) will help you with this process. The FAFSA application is available for submission beginning October 1st each year. You will submit your FAFSA using the tax information from 2 years prior. That means your 18/19 FAFSA will use the information from the taxes you filed in 2016. Most students and parents should be able to download their tax information into the FAFSA using the IRS data retrieval tool. TSU's FAFSA Priority Deadline is March 31st but earlier is better! The initial FAFSA filing date is used for awarding limited funds so earlier is better. FAFSA applications submitted after March 31st may still be eligible for federal financial aid such as the Pell Grant, FORD Direct Loans, and PLUS Loans. The U.S. Department of Education is requiring Texas Southern University (TSU) to review your Free Application for Federal Student Aid (FAFSA) information and verify the data entered on your FAFSA is accurate. This process is called verification. Fill out the Free Application for Federal Student Aid (FAFSA) each year and be sure to list your year in college as 5th year/other undergraduates. As a student seeking your second bachelor’s degree, you may be eligible to receive federal Ford Direct loans. We are not able to offer post- bacc students federal need-based grants such as the Pell Grant or SEOG. You have the same yearly and aggregate loan maximums as other undergraduates. If you are considered a dependent student, your parent may also apply for the Parent PLUS loan on your behalf. Please see how your parents can help. A signed copy of your degree plan may be requested to determine the courses eligible for payment through financial aid. Dependent student: maximum of $5,500, freshman, $6,500 sophomore, $7,500 junior/senior. Independent student: maximum of $9,500 freshman, $10,500 sophomore, $12,500 junior/senior. Dependent student loan maximums may increase to match the independent amounts in cases where the parent is credit denied for the parent plus loan for that aid year. After the parent is credit denied for that year, the student may request an increase by submitting a File Update Form. Graduate students typically pay for their education through a combination of loans, scholarships, grants, fellowships and employment through their institution. There are some departments who are able to fund students through various grants and fellowships as well as teaching assistantships and research assistantships. You can learn more by visiting your academic department’s website. Degree-seeking graduate students may apply for federal student aid by completing the FAFSA application at FAFSA.ed.gov each year. If the student is eligible, the FAFSA will result in an offer for an unsubsidized Ford Direct loan. The FAFSA application will also allow the student to apply for the Graduate PLUS loan online if they need additional aid. Both of these federal loans require the student to be enrolled at least halftime in a degree-seeking program. Graduate students are not eligible for federal Pell grants or federal subsidized loans. A graduate (non-professional) student may receive up to $20,500 per year in a direct subsidized loans. The aggregate maximum for a graduate (non-professional) student is $138,500. The interest rate and origination fee for the Federal Direct unsubsidized loan can be found on the FSA website. You must complete the Entrance Counseling and Ford Direct Loan Master Promissory Note (MPN) online at StudentLoans.gov. The Federal Direct Grad PLUS Loan is a credit based loan borrowed by graduate students to assist with educational expenses. You may to borrow up to your remaining cost of attendance after all other aid. The loan does not have an aggregate limit. The loan is unsubsidized meaning you are responsible for paying the interest during times of deferment. The interest rates and origination fees on the Federal Direct Grad PLUS Loan vary by year and can be found on the FSA website. You must complete a Direct PLUS Loan Application, Entrance Counseling, and Master Promissory Note (MPN) online at StudentLoans.gov. The credit check, run as part of the application, is only valid for 180 days. Do not complete the application before June of the year you will start attendance. For applicants who have been determined to have an adverse credit history, but qualify for a Graduate PLUS loan by documenting extenuating circumstances or obtaining an endorser must complete a new Master Promissory Note and PLUS Counseling online at StudentLoans.gov. To receive federal loans, master’s degree seeking students must be enrolled at least halftime (5-8 credits each term) and doctorate degree seeking students in a minimum of 5 – 1 hour depending on the student’s position in completing the course of study.